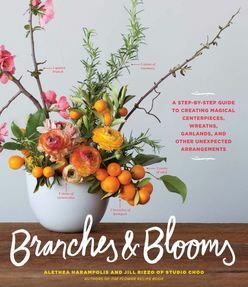 Alethea Harampolis and Jill Rizzo, authors of The Flower Recipe Book and founders of Studio Choo, provide more than 100 step-by-step projects to make with flowering and leafy branches. In the spring, readers can create a cherry blossom bough or a centrepiece of lilacs and olive branches. In the summer, a garland features sage with pomegranates and citrus-coloured strawflowers. In autumn, wreaths are made out of magnolias and rosemary. Winter highlights cedar, pine, and juniper, yielding unexpected table settings and new wreath shapes. Also included are hundreds of step-by-step photos, as well as tutorials covering basic techniques, sourcing, and care information. Create stunning arrangements all year long with flowering and leafy branches (including centrepieces, garlands, place settings, wreaths, and more).